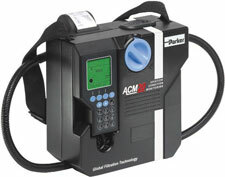 The ACM20 is designed to be easy to use and fast to provide results. These accurate downloadable results can be manipulated to provide valuable predictive maintenance statistics. 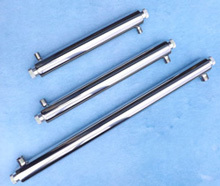 Standard industry quick connections are suitable for taking a sample, a small amount of waste is produced during sampling, but not the amount generated when testing a Millipore. Examples of field use are demonstrated here (Pictured left). The vessel DP was steady and a Millipore showed nothing was wrong. Having taken the results and knowing that the elements were 1 micron, it was decided to inspect the installation after carrying out a test. In addition to counts per ml, the ACM20 software also provides a particle distribution detecting the % of particles across the 6 channels, which can be checked against 'soon to be published' OEM recommendations for dirt levels. Downloaded data can easily be turned into useful trend, presentation data. As well as the handset displayed graphic or downloaded data, a hard copy can also be printed from the ACM20 unit. The Icount Particle Detector from Parker represents the most up to date technology in solid particle detection. 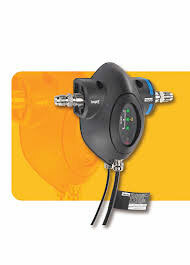 The design dynamics, attention to detail and moulding compactness of the permanently mounted, on-line particle detector module, combined with on-board, laser based, leading-edge technology, brings to all industries a truly revolutionary, particle detector as a remarkable cost effective market solution to fluid management and contamination control.